From Goodreads: Katsa has been able to kill a man with her bare hands since she was eight—she’s a Graceling, one of the rare people in her land born with an extreme skill. As niece of the king, she should be able to live a life of privilege, but Graced as she is with killing, she is forced to work as the king’s thug. When she first meets Prince Po, Graced with combat skills, Katsa has no hint of how her life is about to change. She never expects to become Po’s friend. She never expects to learn a new truth about her own Grace—or about a terrible secret that lies hidden far away. . . a secret that could destroy all seven kingdoms with words alone. With elegant, evocative prose and a cast of unforgettable characters, debut author Kristin Cashore creates a mesmerizing world, a death-defying adventure, and a heart-racing romance that will consume you, hold you captive, and leave you wanting more. I shouldn’t have waited so long to read Graceling. I should have known, having seen the rave review of my friend Erin Bowman (who has exceptional taste in books), that Graceling would blow my mind. And it did! 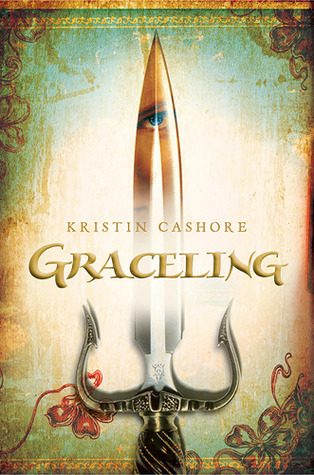 Graceling reminds me a bit of Plain Kate by Erin Bow (fantastical elements, multi-faceted herione), a bit of Game of Thrones by George R. R. Martin (epic power struggles, shady politics), and also a little of X-Men, what with the Graced and their exceptional skills. Thanks to Kristin Cashore’s elegant and imaginative writing, all these larger-than-life components come together in an incredibly captivating story. Because I have no interest in spoiling the awesomeness of Graceling for you, I only want to discuss one of its aspects, and that just happens to be one of my favorite aspects: Katsa’s character arc. Anyone who reads and/or writes YA probably knows about the call for strong female protagonists. There’s a lot of discussion about what makes a female protagonist strong (ex: Katniss) or weak (ex: Bella) and what affect these varying degrees of strength have on the teenage girls (or adult women!) who read about them. What I loved most about Graceling‘s Katsa is that her strength, while very much present, is not at all black and white. Sure, she’s physically strong (thanks to her Grace, she can whip the asses of scores of men all at once), but inwardly, she’s kind of a mess. She’s fiercely independent, but she’s not in control of her bodily power — in fact, she’s afraid of it and the carnage it’s capable of causing — so she spends quite a bit of time doubting herself, her integrity, and her intelligence. But once Katsa begins to confront her anger and her past (thanks in part to the unwavering friendship of one very adorable Graced prince), she learns to trust, and she’s able to start taking control of her physical strength and get a handle on her emotions. A slew of external challenges force her to continuously test her patience and willpower, and Katsa eventually grows into a wholly likable and entirely powerful person. Tell me: Which YA heroine do you consider to be exceptionally strong? Totally agree. I loved everything about this book. I can’t wait for BITTERBLUE to come out! Uh, yeah… I want read FIRE immediately! I’m totally sucked in to this world! I just started reading this last night. 😛 A friend of mine raved about it, and knowing that you loved it, too, makes me even more excited to finish it! Katsa is probably my favorite YA heroine. Now I’m just waiting for Bitterblue like Meredith. Like I told Meredith… I’m so totally invested in Katsa’s world now. I can’t wait to move on to FIRE and eventually BITTERBLUE. Such awesome books! I agree: Katsa could be a bit abrasive, but I kind of appreciate that she was imperfect. And Po was so often an ideal balance to her personality, so she didn’t bother me too much. In fact, it was pretty awesome to watch her grow and change. Thanks so much for recommending this one, Erin. I obviously LOVE it! Thanks for the review! I loved Graceling and agree that Katsa is a fabulously complex character. I haven’t read FIRE yet but I definitely need to before BITTERBLUE comes out. Katy, you know what book you should check out? Its not girl-centric but THE FALSE PRINCE by Jennifer Nielson. Its a new fantasy YA about orphans and tricksters and games we play. It is told from the POV of a 15 year old boy (who sometimes sounded 13 and other times I wanted him to be 17…yea I was conflicted lol…but apparently the author wrote MG before this). There is no romance in it, which at first I was sad about because I heart the romance in high fantasy but then I realized something…..this book didn’t need it. Ooh, your birthday is so full of awesomeness! THE FALSE PRINCE sounds very cool. I usually steer clear of books without a romantic thread, but this one sounds like it might be too good to pass up. Thanks for the rec, Rachel! This is the third time I’ve seen this book pop up in the past few days. Clearly I need to add it to my TBR. I resisted for awhile, Liz. I’m not a huge fantasy person, but there’s just SO MUCH to love about GRACELING. I hope you’ll give it a go! Ohhh, I haven’t read this one yet – but I’ve heard so many wonderful things! Will definitely have to put this on my TBR list! Great reco on the book – thanks, Katy! GRACELING is amazing, Erin. Definitely pick up a copy when you have the chance! And no, I haven’t dropped my books yet, but I have them all ready to go. I’m going to wait until around 1:30 or 2:00, until right before the high school lets out, then drop them at spots nearby so hopefully teens will be the ones who snag them. Looking forward to it! Oooh, boy do I love this cover and this blurb! Haven’t read it yet, but holy cow is it going on my TBR list asap! Thanks Katy! It’s pretty amazing, Lindsay! I hope you get a chance to read it, and love it! Ooh, I’m so glad you’re sharing Katsa with the world, Jaime. I hope whoever picks up her book (as well as Katniss and Karou’s!) loves it! Agreed! I’ve yet to hear of anyone who DOESN’T love this book! Just by the cover alone, I want to read that book! I am very much into Amy and Elder right now…and will soon start JELLICOE ROAD but GRACELING is moving up my TBR! Aaaah! I’m so glad you loved it! I remember seeing that you were reading it, so it’s good to hear what you thought. I totally agree with you on Katsa; she wasn’t always easy to like, but she was complex and compelling. I love that for all her strength, you could really see how vulnerable she was too.